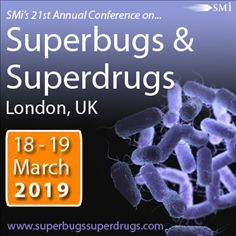 In just 4 weeks’ time, SMi's 21st Annual Superbugs & Superdrugs Conference will kick off in London, setting out to provide an international audience with key updates on the latest developments in combating antibiotic resistance, including the processes and strategies pharmaceuticals use to develop novel therapeutics that utilise alternative mechanisms to treat multi-drug resistant infections. In the run up to the conference, SMi caught up with this year’s co-chair Lloyd Czaplewski, Director at Chemical Biology Ventures, to learn more about his role and valuable perspectives on the state of the global threat of antibiotic resistance. Q: What do you do in your day to day role and what perspective do you bring to the conference? A: I work as CSO at Persica Pharmaceuticals Ltd, a clinical stage company, working on a novel treatment for Chronic Low Back Pain caused by bacterial infection of the spinal disc. In addition, I consult through Chemical Biology Ventures Ltd and work with Universities and funders e.g. Novo Repair Impact Fund. Q: What role do you believe finding higher quality antifungal hits plays in leading the fight against AMR? A: Better target validation and more tractable hits are both important, but the problem is multi-factorial. Look up a 20-set Venn diagram and consider that the candidate is represented by one sector. That's the type of problem we are trying to solve. The two-day conference will host 19+ senior industry experts giving detailed presentations on antimicrobial research development, novel antifungal agents, funding and regulations updates, as well as two half-day, post-conference interactive workshops on: “Understanding the complexity of the microbiome and how to navigate it” and “Understanding PK/PD in antimicrobial research”. The newly updated conference brochure is available to download on the event website, which contains the full two-day agenda and speaker line-up, at: http://www.superbugssuperdrugs.com/vueliopr where interested parties can also register.